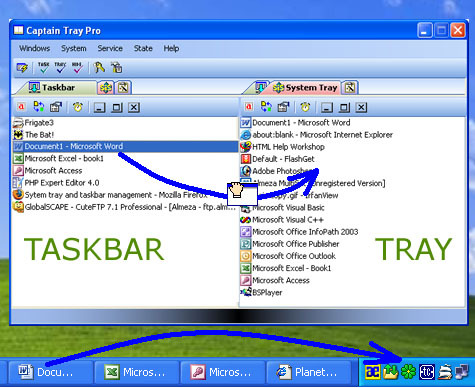 Captain Tray - System tray and Taskbar management. Many users need several applications running simultaneously. Some of those applications are used quite frequently, others - only when they are needed. So, the Windows taskbar can once get fully packed - everything seems to be necessary, and you have no desire to close any programs. Some applications can be minimized to the system tray (the area by the clock in the bottom right corner of the screen), but what shall we do about 'Notepad', 'Calculator', 'Microsoft Word', 'Microsoft Excel', and other our favorite programs? Captain Tray Pro is right there to help you. The program allows you to easily minimize active windows to the system tray, taskbar or hideboard. Working with Captain Tray Pro is similar to working with file managers. The program's interface was specially designed to let its user manage the contents of the desktop with the same ease as he manages the contents of his computer's disks.